Sons of German Jewish immigrants, Louis, Benjamin and Isaac Stern started a dry goods business in Buffalo, New York in 1867. The next year the ambitious young men moved their one-room store to New York City. Their lofty aspirations, mixed with marketing genius, resulted in their outgrowing two stores by 1878. Now, despite the Financial Panic the gripped the city, they were ready to make their impact on the emporium district known as the Ladies’ Mile. The massive Stern Brothers Department Store on West 23rd Street was a favorite of upscale shoppers. Here, in 1879, socialites could shop for imported Parisian suits. That year one from Worth could be had for $375; or another by Pingat in silk for $400—more than $9,600 today. The three brothers who had started out in a humble dry goods store in Buffalo were now among Manhattan’s wealthiest merchants. In 1884 Isaac Stern and his wife Virginia laid plans for a suitable home. The building plot at No. 835 Madison Avenue had been acquired and the architect chosen. Directly below the article was the announcement “M. Sternberger is about to have erected for his own occupancy a handsome four-story high stoop brown stone private residence.” Sternberger was another wealthy merchant and his home would rise simultaneously next door to Stern’s. But Isaac Stern’s mansion, at 28 feet, was a noticeable six feet wider—letting the passerby know which homeowner was richer. Schickel, like Sternberger’s architrects Thom & Wilson, turned to the Queen Anne style for the house. Yet, while the two would be architecturally harmonious, the Stern residence was slightly more formal. Clad in brick with contrasting brownstone trim, it was splashed with historic elements—Tudor inspired windows at the third floor, Elizabethan “strapwork” decoration below the cornice just above them, and a carved stone Chinese Chippendale railing, for instance. The mixture of historic styles included a Chinese Chippendale inspired railing. Next door, to the left, is the Queen Anne style home of Mayer Sternberger. The completed home cost Isaac Stern $75,000 above the price of the plot (in the neighborhood of $1.85 million today). Isaac and Virginia Stern would live quietly in their Madison Avenue mansion for a decade. Then in February 1894 it was sold to grain broker Edward Cushman Bodman, who had been living in an upscale home at No. 7 East 74th Street, just off Fifth Avenue. The Bodman’s social status would be enhanced when, in 1901, construction was started on their grand Shingle-style summer cottage “Felsmere” in Bar Harbor designed by Grosvenor Atterbury. Eventually Carlsen, the butler, decided to investigate in the dark sub-basement. He carried a candle to light his way. “He soon found where the gas was, for it ignited and hurled him into the back of the cellar, with his hands and face badly burned and his hair singed to the scalp.” Carlsen was found unconscious by the servants who rushed to his aid. Herbert and George attended Yale University, studying finance. George was somewhat a loose cannon when it came to motor cars. On Sunday March 31, 1907 bicycle Patrolman Leehane caught the 25-year old George going 18 miles per hour on Riverside Drive between 76th and 78th Streets. “He said he had increased his speed to go up a hill,” said the New-York Tribune. But Bodman’s alibi did not hold water with witnesses. The New York Times reported “The speed of the automobile had attracted the attention of those on the drive, so when the policeman started after it there was much cheering. George did not have the $100 bail, so he was forced to stay in the station house for about half an hour while his friends hurried about to get the money. When he appeared before Magistrate Crane he tried another tactic. “Bodman told the Magistrate that he wanted to have his case settled as soon as possible in order to get to church, where he was due to take up the collection,” reported The Sun. Even minor scandals involving the sons of wealthy businessmen were good press; so a reporter asked Bodman for the names of his friends. “I wouldn’t have their names known for $1,000,” he snapped. Eight years later a more mature George Bodman found himself back in court—this time to answer a charge of “running his car with dazzling headlights in the city.” He would be fined $1. But while he waited for his case to come up, he listened to the hard luck story of two young men. Frank Reilly was just 21 years old and William Cody was 24. Both men were from Boston and set out for New York in hopes of finding jobs. Having no money, they jumped a freight train; but were caught. George, now a 33-year old banker, sympathized with the struggling young men. The Times said he “remembered being stranded once.” He spoke to the clerk privately and asked to be allowed to pay their fines. The young men, on George’s request, never knew who bailed them out. Both Edward and Ida Bodman were active in charities and philanthropy. They donated the Edward C. Bodman Ward in the Men’s Hospital at Tehchow, China; and Ida was President of the Women’s Advisory Committee of New York University’s Department of Training Teachers of Backward and Defective Children. Edward Bodman refused to retire. In 1916, at the age of 78 he still was active in the running his firm, Milmine, Bodman & Co. But that summer his health declined. He was forced to remain at home and about six months later, on January 21, 1917, he died. His funeral was held in the Madison Avenue home on Tuesday January 23 at 10:00 a.m.
Ida lived on in the house with her two sons. The following year George helped found the Manhattan Navy Club “for the entertainment of petty officers and enlisted men of the navy.” His name was back in the newspapers in September when his engagement to Louise Clarke was announced. They had met during their war-time work with the intelligence department of the War Trade Board. Herbert, still unmarried, was a member of his father’s firm and remained in the house with his mother. The Social Register would list them here until 1921--the year that the 66-year old Ida Berdan Bodman sold No. 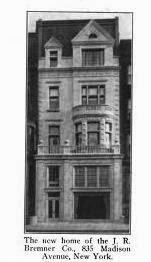 835 Madison Avenue to upscale decorators and art dealers J. R. Bemner Company. It was the end of the road for the private home on a rapidly-changing Madison Avenue. The firm, which in June, announced “extensive alterations,” removed the stoop and installed a two-story storefront at street level. Upstairs the handsome rooms that were once filled with Ida Bodman’s costly furniture, carpets and paintings were transformed to apartments. On August 9, 1926 a second floor tenant was having trouble with the lock on her door. “At the entrance of the building she met a detective of a private agency and enlisted his aid in locking the door” reported The Times the following day. While they worked on locking the door, the electric burglar gong in the decorator shop downstairs went off. The detective went downstairs to investigate and found the shop door ajar and noticed the lock had been jimmied. While he had been helping the woman upstairs, thieves had been busy in J. R. Bremner & Co. It was most likely the noise made by the tenant and the private detective that prevented the burglars from making off with more loot. But they nevertheless stole a Gobelin tapestry and three modern tapestries valued at $10,000 in total. In 1931 architects Charles N. Whinston & Bro. redesigned the retail space. Throughout the rest of the century it would be home to upscale art galleries and shops--in 1981 to Woodard American Antiques and Quilts, and in 1997 the first New York store of Italian shoe maker Sergio Rossi. Today it is home to the high-end Swiss luxury clothing brand Akris. Above, Isaac Stern’s 1884 Queen Anne mansion is remarkably intact. It and the Sternberger house next door are a delightful surprise for the passerby who bothers to glance above street level.